The #SoLetsPigOut Potluck is still in full effect. Yup, it’s still that week where we’re hanging out with The Pig & Quill and getting our pigout on, potluck style! The week keeps chugging right along with all of it’s fun recipes and prizes! Speaking of chugging, did you check out yesterday’s post for Herbed Pineapple Limeade? Totally chug worthy. Oh, and I’m still not over those Sticky BBQ Korean Chicken Wings from Monday either. It’s not truly summer unless you’ve allowed yourself to get good and sticky with a chicken wing. I’m not sure that’s a real rule, but it should be. Let’s write our own rule book. I propose that pants should be optional. It’s summer. It’s hot. You know I’m right. 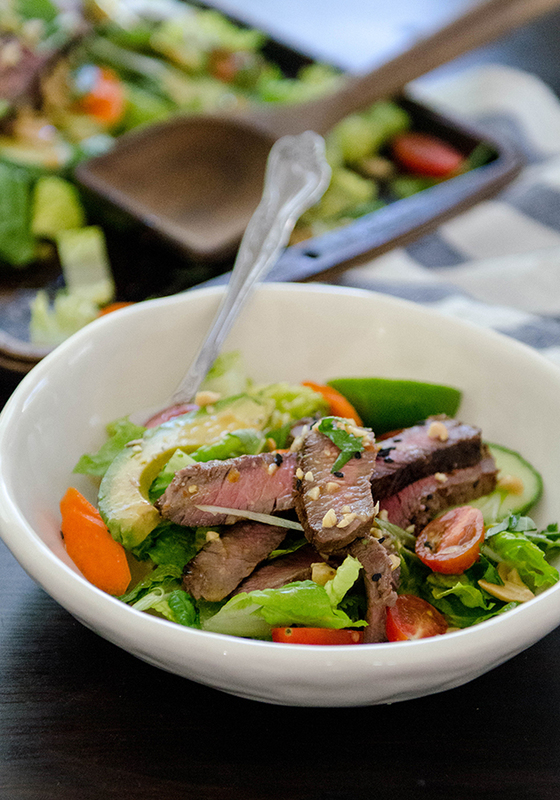 Today Em and I are sharing a recipe for this glorious steak salad. We’ve loaded it with veggies and tons of Asian flavors. 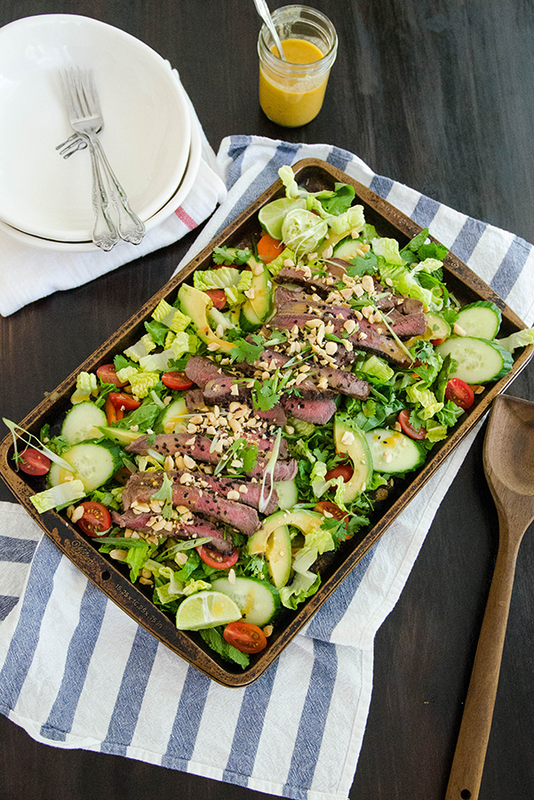 We’ve topped it with grilled steak, some peanuts and a sassy honey lime dressing. Can I just get honest with you for a minute and talk about how much I love steak? I know, I know. We’ve been over it before. But really, it’s my spirit food (I really hope that doesn’t imply dead spirit animals-because, no). This steak is marinated to perfection. I want to eat it for breakfast. Out of the fridge. Cold. With my hands. Oh, wait…I did. Yeah, I’m an animal. Also, it’s really hard to eat salad with your hands and still look like a lady. Just ask my husband (who’s Dutch and uses a knife and fork for EVERYTHING). Luckily for me, Emily was just as into this salad as I was. We feverishly ate the remains of the steak off of a cutting board before it even made it to the photos. Oh, look. 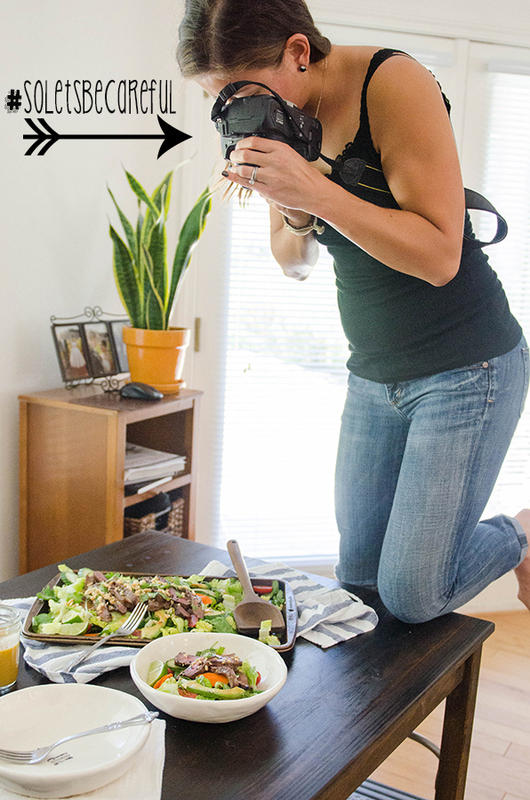 Here’s a photo I shot of Emily shooting a photo of food. If you notice, she is precariously balanced on my desk, hanging on by her ninja kneecaps. Things usually look something like this behind the scenes. #SoLetsPigOut could have quickly become #SoLetsBreakOurNecksShootingSalad. But, this is just another day in the office. One time I fell into a glass table while shooting granola. Those are the moments that make you question your life decisions. As I shot this photo, Emily made sure to crack a joke we’re pretty much doing THIS. Accurate. As you can imagine, all of that table climbing works up a bit of an appetite. We ate enough salad for four-six adult humans. To be clear, we are only two adult humans. You should totally invite us to your real life summer potluck. We’ll eat all your food. Promise. 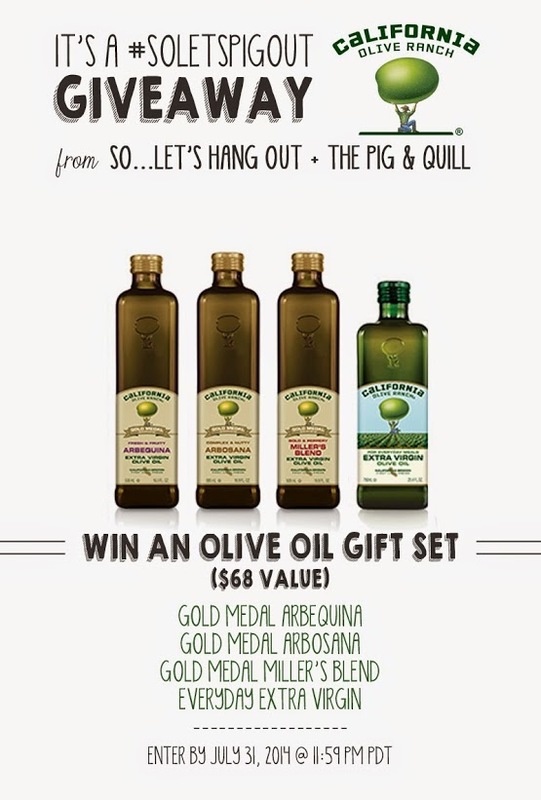 Besides bringing you salad, we’re also bringing you a chance to win a lovely gift set from our friends at California Olive Ranch! If you’re like me, you can never have too much good quality olive oil around! I even use it to remove my make-up. Did I just out myself as a crazy hippie? Meh. I’ll take it. Before you dive head first into that Rafflecopter widget, please consider signing up for the So…Let’s Hang Out Weekly Newsletter. I’ll send you updates straight to your inbox and alert you of fun giveaways such as this one! I won’t spam you, but I’ll probably tell you I love you and how to make cookies. Subscribe to the So…Let’s Hang Out Newsletter! Did you enter our other giveaways this week? Let’s make sure! You wouldn’t want to miss out on fun prizes. Who doesn’t like prezzies? 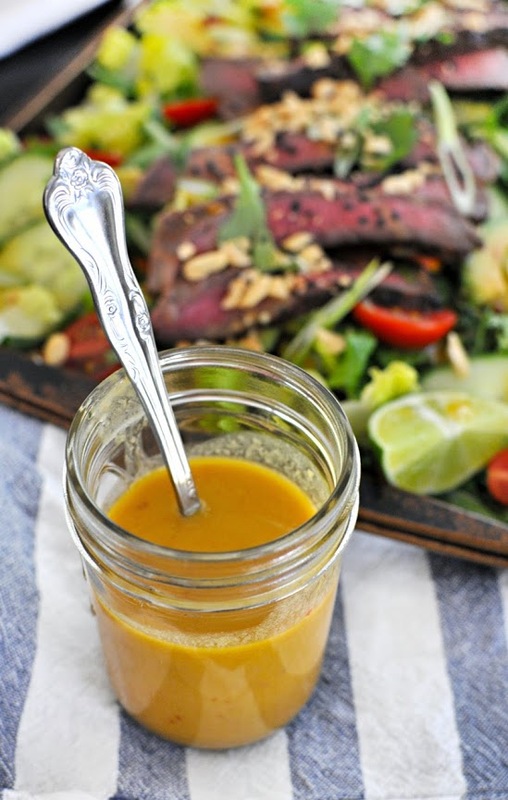 Below you’ll find our recipe for the crazy-delish Sesame + Lime Vinaigrette! 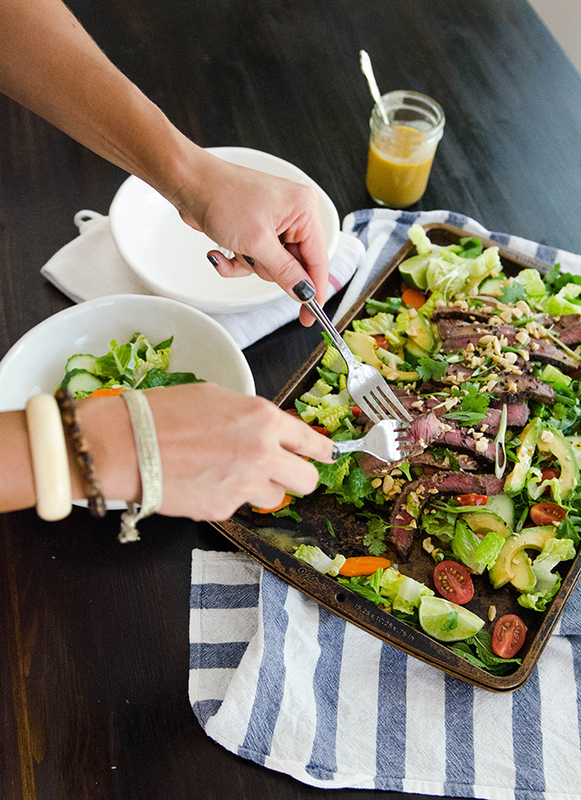 To get the recipe for the rest of the salad, head on over HERE. Combine all ingredients in a sealed mason jar and shake until well combined. 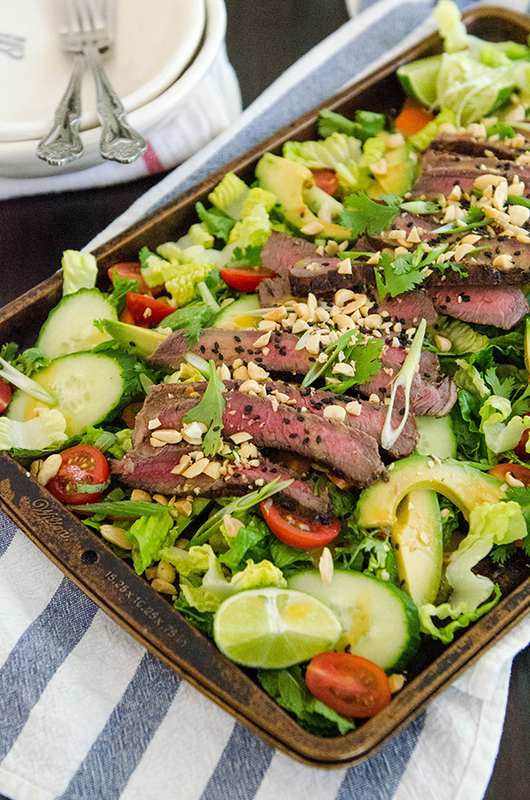 Top over Grilled Thai Beef Salad and serve! I am obsessed with this salad, absolutely amazing! MORE MORE MORE MORE MORE.